FILING 4:00-5:00PM ON DECEMBER 17 2018. TIME OF LOTTERY: 5:00PM ON MAIN FLOOR OF LIBRARY. The Broadview Library’s phone system is malfunctioning. Our ability to receive phone calls is limited. We hope to have the problem resolved as soon as possible. We appreciate your patience in this matter. Because the weather situation, the Broadview Public Library District will be closed Monday morning. The Library will open at 1 pm on Monday, 11/26, barring any unexpected circumstances. We hope you all stay safe and warm. 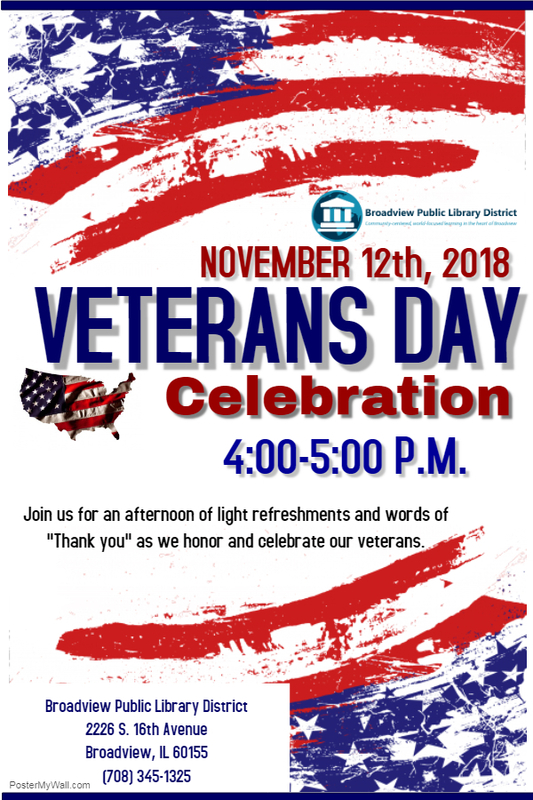 The Broadview Public Library District will close at 5 pm on Wednesday, Nov. 21st; and be closed on Thursday, Nov. 22nd; & on Friday, Nov. 23rd, in observance of the Thanksgiving Holiday. The Library will return to its normal schedule on Saturday, Nov. 24th. We wish you and yours a happy and heathly holiday. The Broadview Public Library will be without telephone services during the morning and afternoon of Tuesday, November 13th. The phones will be down to allow for the installation of a new system as part of the Library’s renovation. We apologize for any inconvenience this may cause. 16th Avenue in front of the Broadview Public Library District will be closed for construction between 8:00 AM to 4:00 PM on Wednesday, 10/31; Thursday, 11/1; and Friday, 11/2. The Library will be open for service during our regular time, however you will only be able to reach us by foot. Thank you for understanding and we appreciate your patience during this time. Join us for light refreshments and words of thanks as we honor our veterans. The Library should return to normal hours on Saturday, 9/29. We apologize for any inconvenience this may cause. Fall Reading Rewards starts Monday, September 10th and goes through Friday, November 9th. 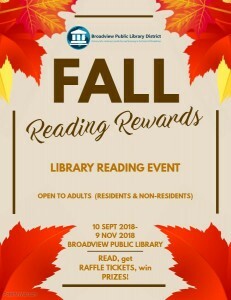 Fall Reading Rewards is a fun incentive reading program open to all adults. 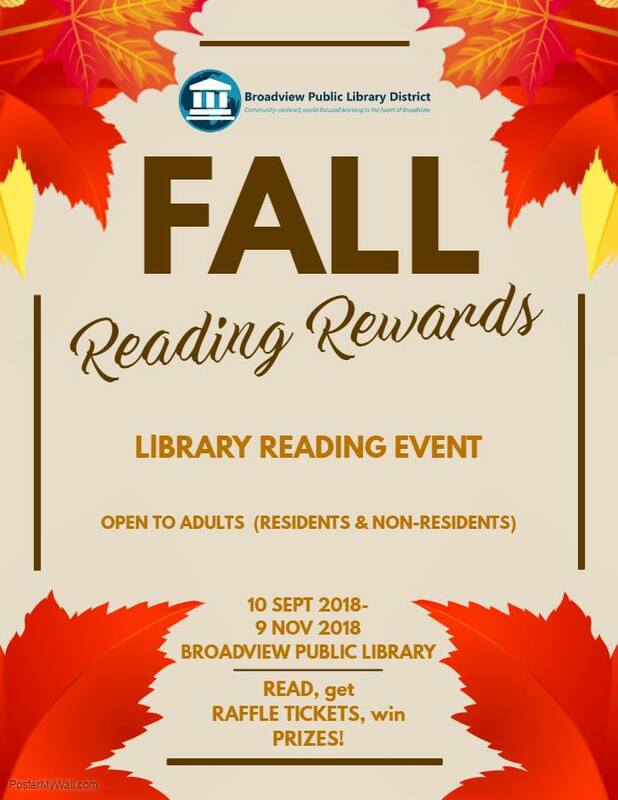 All you do, is check out books from the Broadview Public Library circulation desk and enter your name in the raffle drawing (one raffle ticket per day). Winning raffle tickets will be drawn every Friday and prizes can be redeemed at the Broadview Public Library reference desk (prizes will be held up to one week after the drawing).